Rodney’s background in equities, financial research, investment banking and venture capital makes him an unconventional but authoritative champion for impact investment. Joining Wall Street in 1980, he rose to become the number one ranked financial services analyst at PaineWebber and then held senior management posts at Lehman Brothers and Paribas, before leaving the sector in 1997 to found the venture capital firm Catalyst. At Catalyst, Rodney became passionate about innovative businesses that earn a living by trying to make the world a better place. 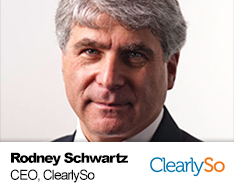 A pioneer in this impact investment marketplace, he transformed Catalyst into a social business consultancy and in 2008 launched ClearlySo, which raises investment for high-impact businesses, charities and funds. Today ClearlySo is Europe’s leading impact investment bank, and has helped more than 120 clients raise more than £150 million in investment capital by leveraging its extensive network of high-net-worth individual and institutional investors. Rodney teaches impact investment at the Said Business School (Oxford) to MBAs and has guest-lectured at other European universities, and is a regular sector commentator and writer. He is a past Chair of Shelter, the largest UK homelessness charity, and JustGiving.com, the world’s largest online donations platform. He holds an MBA and BA from the University of Rochester, in the USA.